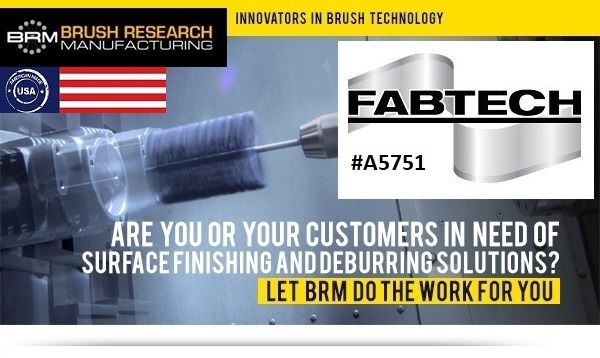 Brush Research Manufacturing (BRM) will showcase surface finishing solutions at FABTECH 2017. Meet us in Booth #A5751 from November 6-9 at McCormick Place in Chicago, Illinois (USA). Flex-Hone tools deburr and suface finish cylinder walls. NamPower diamond wheels produce edge radii on hard materials. NamPower small-diameter abrasive disc brushes reach tight spaces. Don’t miss your chance to learn more and talk to our Technical Team. Request a meeting with BRM at FABTECH 2017. Need help registering for the show? Get a FREE pass on us by filling out the form.